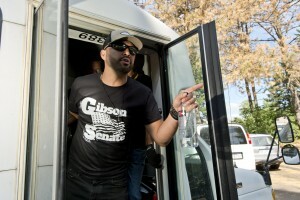 Things got a little bit emotional at last night’s Battle Ground City Council meeting where Patriot Prayer founder Joey Gibson and others tried to convince the council to take action against a gun control initiative passed by voters last fall. During the meeting, there was talk about voter nullification, Nazi Germany, sheeple and Gov. Jay Inslee’s presidential run. The meeting ended with an outburst and was followed by dueling social media posts about upholding the constitution and socialism. Since Washington voters passed Initiative 1639 with nearly 60 percent of the vote last fall, Gibson and other activists have been appearing before local city councils in hopes of persuading them to adopt an ordinance limiting local law enforcement’s role in implementing the measure. Over the last month, Gibson and others have viewed the city of Battle Ground as the most receptive to adopting an ordinance. His group has held four events in the city in hopes of persuading the city council to get on board. A day after holding his most recent rally, Gibson and others appeared before Battle Ground City Council. “It’s a slippery slope and we’re going to go over to a bad place if we don’t do something,” said Gibson after recounting a story about a woman who was arrested and tortured in Nazi Germany after being caught giving out dissenting fliers. Several members of the city council seemed sympathetic yet cautious. Councilmember Brian Munson said while the initiative passed in Clark County, a majority of Battle Ground voters cast ballots against it. He said that he wanted the city attorney to evaluate their options and find a way to “have a voice.” But he said, “if we can’t do that, we can’t do that.” He also called out Inslee, who has come under scrutiny for increased security costs as he runs for president. Mayor Mike Dalesandro struck his gavel and told the crowd that there would be no more outbursts and he would eject the next person who spoke out. Johnson continued with his remarks saying he believed in the system. “It’s not Mr. Inslee’s law; it’s not Mr. Ferguson’s law; it’s your neighbors’ law,” he said referring to the governor and state Attorney General Bob Ferguson. Dalesandro said that he’s received many phone calls and emails and that he agreed that there are portions of the law that are “flawed.” But he said that change would come from the courts or the Legislature and cautioned the council on proceeding with an ordinance. Earlier today, Dalesandro took to Facebook and Twitter to criticize Gibson for a “disrespectful outburst” that was directed toward a “26 year Army veteran” on city council, almost certainly a reference to Johnson. Dalesandro reiterated his position that the ordinance would be outside the council’s scope. Gibson initially responded with a Facebook post stating that he had an outburst after listening to a city council member say “he doesn’t care if 51% of the population votes to enslave the other 49%.” Gibson wrote that he became “extremely emotional and I should have not acted that way.” He also wrote he was trying to stop a civil war while Dalesandro was controlled by the Democratic Party. By afternoon, one of Gibson’s conciliatory posts appear to be taken down. 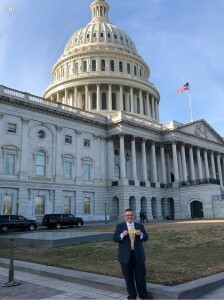 Patriot Prayer later posted pictures that Dalesandro had taken on a February trip to Washington D.C. of him with House Speaker Nancy Pelosi and U.S. Rep.Alexandria Ocasio-Cortez, a self-described “democratic socialist” from New York. The post included the mayor’s contact information.